Everyone gets sick, but not everyone is able to take the day off to take care of themselves or a loved one. Over 4 million Texas workers do not have access to paid sick days. That means when a worker is sick or their loved one is sick, they are at risk of losing their wages. Many workers, including those that work in the service industry, are at risk of losing their jobs if they are sick. The Texas Legislature is considering a bill that would allow for ALL Texas workers to earn paid sick days. While some legislators want to take paid sick days away from Texans, we know that paid sick days will help us build stronger communities. Paid sick days are good for Texas families, our public health, and the economy. Sign your name now to send a message to Texas lawmakers and tell them to support paid sick days for all! Austin and San Antonio City Council passed paid sick days ordinances in 2018 that would require businesses to provide their workers with paid sick days. 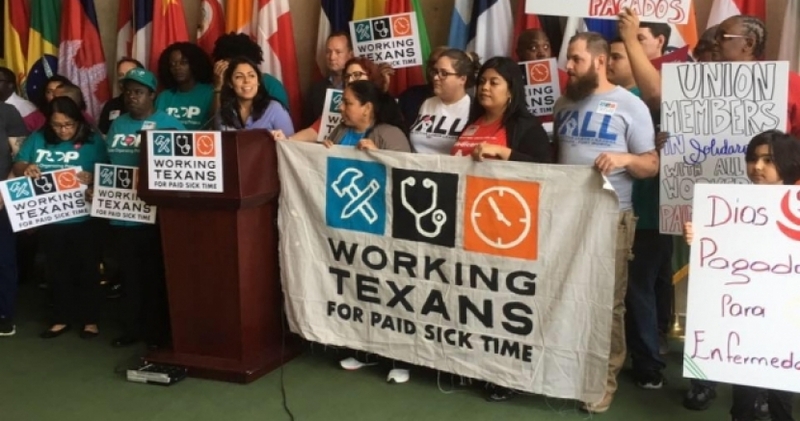 House Bill 3728, filed by Rep. Diego Bernal, would create a statewide policy for employers to provide paid sick days to their employees and make these local solutions a standard for all Texans.